Braun, one of the leading names in the world in the men’s grooming industry, has gone on to become the top league with its Series 9 Electric Foil Shaver models. All of these series nine models are packed with sophisticated technology and give premium brands a run for their money with their performance, durability, precision shaving and comfort. The Braun 9296cc series electric shaver is no exception to this rule. Like all other models in this category, this is expensive; however, it does cost a lot to be the world’s most efficient shaver, doesn’t it? For the Braun loyalists, this should not be too surprising, because they know that all series nine shavers from the company boast of high technology and durability that justify this pricing structure. Read through our electric shaver review to see the features, pros and cons of this wonder product from Braun. 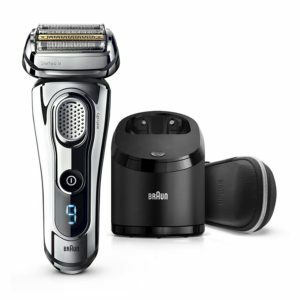 Priced over £300, the Braun Series 9 9296cc Men’s Electric Foil Shaver is one of the sleekest and stylish shavers in the market today. It does come with a lot of automatic features to ensure that you enjoy a smooth shave. Comes in at 4.4 out of 5 stars with 88% four stars or higher, and 1% with one star. This shaver was first available in August of 2016, and comes in at a much higher price than the majority of the electric shavers on the market, but is one of the best electric shavers out there.